Spring Training games hardly mean anything since there are so many players in and out who will not make a major league roster and the pitchers are often throwing one particular pitch over and over again just to refine it, but it's nice to see a win from the Phillies. Despite a wet field that led to the Phillies deciding to scratch Chase Utley from the starting lineup, the Phillies defeated the New York Yankees 4-3 as the skies cleared in Clearwater. There were several positive notes from today's game. Kyle Kendrick started today's game and went two innings, giving up three hits and one earned run. The pitching that followed was also decent. Aaron Cook followed with two scoreless innings, followed by a scoreless fifth inning from Chad Durbin, making his spring debut. Zach Miner gave up two runs in his two innings of work, but earned the win. Roster longshot Cesar Jiminez pitched a scoreless eighth and Jeremy Horst pitched the ninth inning for the save. Offensively, Kevin Frandsen got the Phillies on the board with an RBI double in the sixth inning. The Phillies saw the continued presence of Domonic Brown who belted a solo home run in the seventh inning. But the Phililes would keep scoring in the seventh. After Cody Asche followed wtih a double, catcher Tommy Joseph homered onto the tiki bar in left field to give the Phillies a 4-3 lead, which would prove to be the deciding runs. A little bit of nice glovework today from the Phillies as well. Third baseman Cody Asche made a nice diving stop to turn a double play in the fifth inning. You can watch that play here on MLB.com. 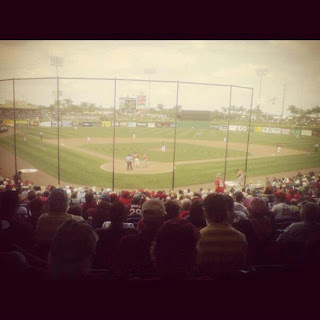 The Phillies return to action tomorrow against the Minnesota Twins in Fort Myers. Lots has happened since my last writing, but we're still a far way from declaring a Phillies roster. Cliff Lee was excellent in his first start yesterday, as Hamels and Halladay were in their's, all good signs for the Phillies. Chase Utley was scratched today though, however the game is in rain delay, so that makes sense. Dom Brown's hitting bombs, and that's a good sign. Here's High Cheese's breakdown yesterday. Here's today's. Oh, and in case you missed it, Michael Schwimer got traded, and was surprised. I'm pleased with the early going, to the extent you can be. These games don't count and the starters don't always play. The pitchers look healthy though, Utley and Howard are playing, Howard's playing well, and Dom Brown looks ready. I'm not overly concerned about the overall results yet though. I'm giving Stutes the benefit of the doubt, for now, on his bad outing. It's his first one, and a lot of the other contenders have struggled. Inciarte's been impressive, though I think his best chance to stay is to be offered back and then traded for. He's raw, but talented. Now, my Lehigh Valley roster predictions, which changed a bit by the trade of Schwimer. A crack at Reading's rotation at least- Morgan, Biddle, Rodriguez, Colvin, Wright. As for the Pigs, this will change, as it would be a dream for all of these guys to accept assignments. For the most part though, this does give you a look at some of the guys who will be here. The closest battlers off this team so far, in my mind, are Morgan, Cody Asche, and maybe Leandro Castro makes a run here. I'm also impressed with Justin Friend's numbers at the least. Lots will change as the games roll on, but this is a good place to start from, for now. Note: Today's game may be subject to suspension due to inclimate weather. The Phillies have lost two and tied in one of the Grapefruit League games they have played in so far. Despite their 10-1 loss yesterday, Cliff Lee was strong as he threw 2 innings of ball while yielding no hits, allowing just one walk while striking out two. Today, the Phillies will take on the New York Yankees for the first time this spring. Kyle Kendrick (2012: 11-12, 3.90 ERA) will get the start today as he opposes Jose Ramirez (2012: 7-6, 3.19 ERA), who played in A+ ball last year. It will be interesting to see how Kendrick has improved over the offseason and how he will form into this season. Jose Ramirez has been an interesting arm for the Yankees to watch in their farm system. This will be his first start of the spring. Notes: Yankees 3B Kevin Youkilis is a scratch for today's game as precaution after suffering a hip cramp. OF Curtis Granderson, who was hit by a J.A. Happ pitch earlier this week, will not be in today's lineup. It is likely that Granderson will miss several weeks as well. I saw a few interviews with Michael Young today. One with Greg Murphy after he was finished his 5 innings of work and one with Michael Barkann on the Phillies Focus show. I was reminded of Raul Ibanez. The veteran who has played his share of baseball, probably on the downside of his career, but saying and doing all the right things. One hopes when this all plays out, Young will have had a successful season at third base and at the plate. Jayson Stark wrote a nice piece today where Cliff Lee sings the praises of his brief time as Young's teammate in 2010 in Texas. As a casual observer, it appears Texas jerked him around a lot. Probably because they knew he'd be the loyal ballplayer at the end of the day. Even after demanding a trade when made a full time DH, he was basically a good soldier and carried on. Lee described Young on Monday as "the perfect teammate" and "the heart and soul of the Rangers," and said he thought the team "borderline took him for granted." "I think that baffled a lot of people who were around that organization. Like I said, he was the heart and soul of that team for a long time, and I can't understand their thinking on a few of the moves they made with him," Lee said. "He's a really good player. I don't know why you wouldn't just let him do his thing." Young appears to be another name on a club that gets it right now. Much like Halladay who is passing the torch to Hamels. Maybe they aren't the best at what they do anymore. But their maturity and their worth ethic will play a big role as they try and make another push at October baseball. Both are deserving of wearing a championship ring one of these days.